The Board of Certification, Inc Exam is the gate keeper to being able to practice in the athletic training profession. A student must graduate from or be in the last semester of a CAATE accredited program before they are able to sit for this exam. The RUATP has had a high first time pass rate on the BOC, Inc exam. The Athletic Training Program (ATP) is consistently above the national average for the first time pass rate. Those students that did not pass on their first attempt were successful on their second attempt. Since 2006, no student has had to take the BOC, Inc Exam for a third time. 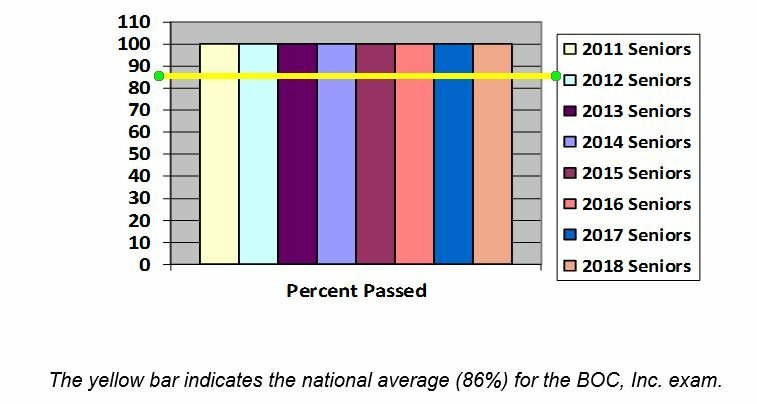 Below is an illustration of BOC, Inc Exam first time pass rates for seniors graduating between the years 2011-2018. The table below also illustrates the number of students graduating from the program who took the examination, number and percentage of students, who passed the examination on the first attempt, and overall number and percentage of students who passed the examination regardless of the number of attempts. Retention Rates – number of students admitted to ATP (spring semester) and returned to Rowan University the following fall semester. Graduation Rates – Tyically, the number of students who began at Rowan University as full-time students and graduated within 150% of normal time (within 8 semesters). We are augmenting this definition to show how many students were accepted into the Athletic Training Program (Professional Phase) and then went on to graduate within 150% of the normal time (4 semesters). It must be noted that the MSAT will begin in Summer 2019, thus these result still reflect the BSAT teach-out plan. The MSAT (current version) will consist of 6 semesters and 2 summer sessions. * 3 students did not graduate due to not meeting program academic requirements, thereby changed major. ** 2 students decided to change major in junior year and 1 student did not meet program academic requirements, thereby changed major. *** 1 student did not meet program academic requirements, thereby changed major. 1 student expected graduation is Fall 2018 due to playing sports (Please see Athletic Participation Policy).